We were SOOOO excited for this cruise. Everything we’d been told we would definitely be stepping up from carnival by choosing this cruise. NOT TRUE. First, the boat itself is spectacular. Lots to do and see, no question. The best pizza joint on the ocean and always stocked. Main dining, SUCKED. Food not good and most nights it was cold. Service sub par in comparison to other cruise lines as far as dining goes. One of the flowrider units went down day 2 and was down all week, that was very annoying. There are many ‘specialty’ dining choices NOT INCLUDED with your purchase of the cruise which is ridiculous. They’re overpriced for the offerings. Nothing outside them either to indicate the extra charge..had to read the cruise compass to find out. Lots of disappointment for folks to be turned away not being able to afford. The solarium area for adults only is amazing and they do enforce the no kids thing which is awesome. They also have their own restaurant which is nice and peaceful for those of us not wanting to be around noisy children. Comedy was the same show over and over, other lines change out performers and shows are different. Cruise director was basically a ghost. Showed up here and there but nothing noteworthy. Street parties were fun. Lacked shows in the theater, other lines have them nightly. Overall the service was subpar except in Giovanni where it was stellar. Out of our entire trip Kaviraj was the best encounter we had and he deserves a raise! Will we cruise this line again, I’m not sure. We cruise because we pay one price and expect additional charges for alcohol, but having to guess all week what we got for what we paid was tiresome and ridiculous. We were SOOOO excited for this cruise. Everything we’d been told we would definitely be stepping up from carnival by choosing this cruise. NOT TRUE. First, the boat itself is spectacular. Lots to do and see, no question. The best pizza joint on the ocean and always stocked. Main dining, SUCKED. Food not good and most nights it was cold. Service sub par in comparison to other cruise lines as far as dining goes. One of the flowrider units went down day 2 and was down all week, that was very annoying. There are many ‘specialty’ dining choices NOT INCLUDED with your purchase of the cruise which is ridiculous. They’re overpriced for the offerings. Nothing outside them either to indicate the extra charge..had to read the cruise compass to find out. Lots of disappointment for folks to be turned away not being able to afford. The solarium area for adults only is amazing and they do enforce the no kids thing which is awesome. They also have their own restaurant which is nice and peaceful for those of us not wanting to be around noisy children. Comedy was the same show over and over, other lines change out performers and shows are different. Cruise director was basically a ghost. Showed up here and there but nothing noteworthy. Street parties were fun. Lacked shows in the theater, other lines have them nightly. Overall the service was subpar except in Giovanni where it was stellar. Out of our entire trip Kaviraj was the best encounter we had and he deserves a raise! Will we cruise this line again, I’m not sure. 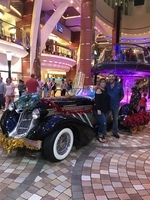 We cruise because we pay one price and expect additional charges for alcohol, but having to guess all week what we got for what we paid was tiresome and ridiculous.